Warthog Lodge is the ideal getaway for those who want to experience nature in stylish comfort. The Lodge can accommodate up to six adults and two children in a main house and two separate chalets. Just bring your own food and beverages. Decorated with a distinct African flavour, Warthog Lodge lies within the Mabalingwe Nature Reserve. The Reserve boasts rolling hills, spectacular scenery and dams. With prolific bird-life and 36 species of wildlife – including the Big Five (lions are in their own enclosure), to mention just some of the wonders that await you. 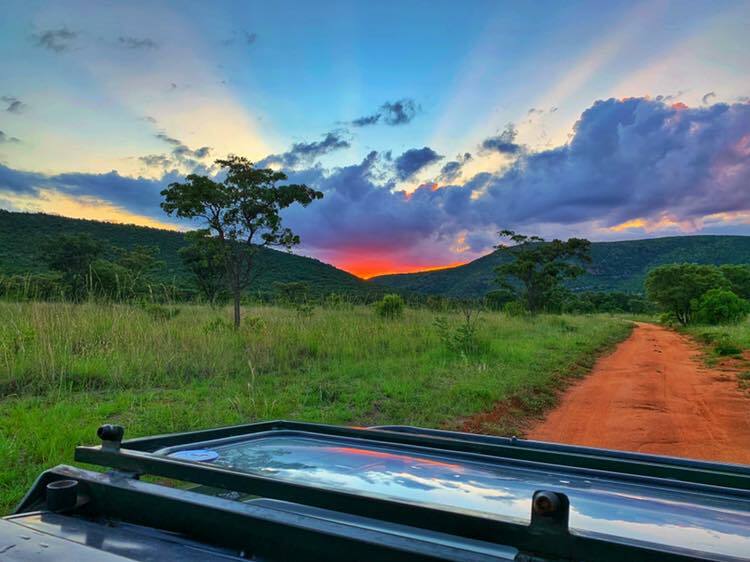 In addition to the awesome surrounds and first-rate accommodation, you can choose from a host of activities; including, game drives, horseback game viewing, cold and heated swimming pools and an outdoor spa. Or, simply soak up the views and the natural beauty from the deck of Warthog Lodge. Game Viewing Vehicle (manual transmission) – optional @ R750.00 a day. Late Check-Out (after 10 am) – optional @ R600.00 – can only be requested 2 days prior to check-out and will depend on availability. There are 2 camp beds and bedding (@ R150.00 per night per bed) available on request for extra children. At Warthog Lodge we have created an eco-friendly system that is kind to the surrounding environment. We are striving to become one of the most environmentally friendly self-catering lodges in the Mabalingwe Nature Reserve. We have implemented a number of small touches to help us reduce our carbon footprint and make it a safer and healthier world for our guests and surrounds. Cleaning Products – Biodegradable Earth-Conscious Cleaning Agents and Bath Products are provided for guest use. Toilet Tissue – It is not because we are cheap, it is because we care that we supply Single Ply Toilet Tissue made from recycled paper. Waste and Recycling – Mabalingwe has a recycling program that we participate in. Tins, glass, plastic, paper and cardboard recyclables are placed in the green bag compartment of the waste bin in the scullery and all other household waste are placed in the black bag compartment of the waste bin. This eases the workload of the Mabalingwe sorting team and results in a cleaner environment. Bedding and Sheets – Made from 100% Percale Cotton and low-impact dyes. Appliances – We have installed energy efficient and water saving appliances. Lighting – We use energy efficient light bulbs (LED & CFL’s) that consume 75% less energy than “old-school” incandescent bulbs. Cooling – All bedrooms and living areas have ceiling fans that has been proven to be 4 times more energy efficient than air conditioners. Used in conjunction with some of the windows that can safely be left open, there is more than enough cross breezes to cool down the rooms. Heating and Cooking – We have installed instant gas water heaters that use safe and environmentally friendly fuel sources (LPG) and also saves on greenhouse carbon emissions. The stove top is a combination of Snappy Chef gas stove (2 plates) and a Snappy Chef induction stove (2 plates).